It's been way too long since I've visited Omonia Cafe, which is no doubt one of the most quintessential Greek cafes in the neighborhood. And while Omonia may carry with it many Astoria-centric stereotypes that we often try to shake, it remains a special place for me, reminding me of my early days here. Dan and I finally went back the other eve, for a late night snack, together with our friends Nuno and Jennifer. We tried a few new things, which left us feeling pleasantly full (and plump). 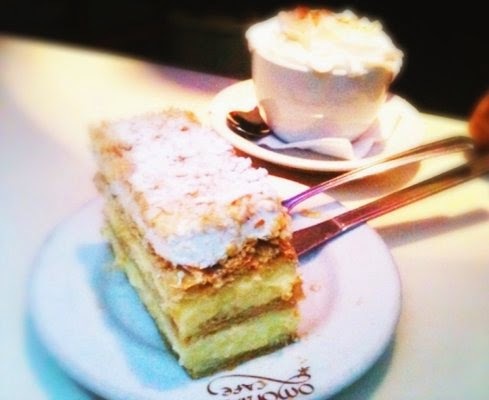 Chocolate Napoleon - Being that I'm Eastern European, I love me some Napoleon (or Kremes, as we say). Omonia's version more than delivered with a light as air filling of smooth chocolate cream that was carefully placed in between crunchy layers of filo dough, topped with whipped cream and more powdered sugar for good measure. Although I couldn't take a photo of our piece because the place is famously dark, I think the above photo helps to paint a picture. Walnut Cookie - Because I was trying to keep to my gluten free diet, I managed to find something without any pastry dough (but truth be told, I cheated that night, as proven by my Napoleon escapades), which came in the form of a walnut cookie. Resembling a macaron in appearance and texture, the cookie was light and airy, hugging the sweet contents of a seedy raspberry jam, producing some serious yum action. We experienced fast and efficient service during the time we ordered and when our sweets were delivered to our table. Even after we finished everything, we felt comfortable to just hang out and were by no means rushed to leave. Pastry prices remain competitive, especially when dining in-house at $4.75 - $7 a piece.